Kathleen Hale is a novelist and a writer for outlets like The Huffington Post and Medium. Her work is funny, moving, and wholly original. Kathleen’s debut novel No One Else Can Have You came out this January. The book is utterly hilarious, and at times it’s heartwarming, but it’s also guaranteed to give you massive chills… because it’s a murder mystery. The protagonist of No One Else Can Have You is Kippy Bushman, a teenage girl who begins investigating her best friend’s brutal murder after the local police force drops the ball. No One Else Can Have You defies the old plot-driven versus character-driven characterization, and it tells a meaningful story without skimping on suspense that makes your heart pound. Weeks after I finished the book, I couldn’t stop thinking about its resolution or its fascinating cast of characters. Fortunately for me, I got to ask Kathleen some questions about her novel, her creative process, girl crushes, and more. Lisa: In No One Else Can Have You, the main character is tasked with reading her murdered best friend’s diary. She finds that her supposed BFF, Ruth, didn’t always have the nicest things to say about her. Why did you decide to have that happen? Did you ever have trouble writing Ruth as a sympathetic character because of it? Kathleen: Personally, I’ve only ever griped in my diary—reading it would not give people a particularly rosy picture of my interior life. I turn to it when I’m struggling or need to unload. I needed to make it difficult somehow for Kippy to take up the task of finding her friend’s murderer. So I thought that handing her Ruth’s would be a way to create tension between them, post-mortem, while also dropping some clues into Kippy’s lap. As far as Ruth’s character… The book begins with her death, but because she’s “present” via diaries throughout the novel, she needed to develop like any other character. Making her surly and full of contempt at the beginning gave me wiggle room to make her kinder by the end. Lisa: I read an interview where you said you knew the murderer’s identity when you began writing No One Else Can Have You. How else do you like to plan out a story before you write it? Kathleen: Outlines are really important to me. I used to write without them and the stuff I wrote was pretty unkempt. So now when I write, I plot out the first act, the second act, and the third act—basically, the beginning, middle, and end of the action. Sometimes I digress from the outline, but I usually know how the book will end. It gives me like…a lighthouse of sorts. I know where I’m going and I can’t get off track and crash into the rocks or whatever. Lisa: Why did you choose to write from the perspective of a teenager? Kathleen: I’ve been writing from the perspective of young adults since I started writing. I guess because I was one, and then because doing so allowed me to write about topics that would have otherwise been extraordinarily depressing. Basically, I’m very interested in what other people would probably call “dark” subject matter, and for me, exploring that territory through the lens of a childlike voice adds buoyancy to an otherwise troubling terrain. Lisa: Which of your characters do you relate to the most? Which do you wish you were more like? Kathleen: Definitely Kippy. The book is very autobiographical…minus the murder. I guess if I were going to be more like any of the other characters…gosh, I don’t know. Maybe Jim Steele, minus the questionable romantic decisions? He tends to look out for number one, for the most part, whereas I tend to care a lot about what other people think, and that can be very distracting. Lisa: If you could pick any other crime-fighting character (from a book, movie, or TV show) for Kippy to work with, who would you choose? Do you think Kippy would like working with them? Kathleen: Definitely Uma Thurman in Kill Bill. I think that Kippy would idolize her. And I think that Uma’s character would be very maternal toward Kippy, which is what Kippy needs, I guess…along with another murderer in her life. Lisa: We have a feature on Pop Culture Puke called “Girl Crush”, where a writer talks about someone who they find interesting and inspirational. Kippy from No One Else Can Have You could totally write a “Girl Crush” piece about Diane Sawyer. Who is your “Girl Crush”? Lisa: Our theme this month here on Pop Culture Puke is “Privacy”. A lot of writers I know keep their work to themselves because they’re afraid of criticism or they don’t think it’s “good enough”. What advice would you give to writers on dealing with criticism? With self-doubt? Kathleen: My go-to readers (prior to the editing stage) are a real estate agent, a cop, a doctor, and a psychologist. So I guess my advice would be to share your work with people you trust, whose work you find interesting, and whose professional know-how is perpendicular to your own. It’s just a suggestion, obviously—everyone’s different. I’m just saying that first readers don’t have to be writers. A lot of aspiring writers I meet think that they need to run their work by other writers. So..show your work to people you feel safe with, because of course you’re not going to feel confident all the time. And don’t expose yourself to people you know will make you feel worse for nothing. Protect what little confidence you have. Speaking of self-doubt, that’s part of the job. A writer asked me the other night if I ever had days where I didn’t believe in myself whatsoever—I told her, yeah, absolutely. I mean, why else would I gravitate toward a profession where reinforcement is totally externalized and my success depends almost entirely on the response of an audience? It’s sick. I don’t write because I think I’m good at it. I write because it’s a compulsion. I can’t stop. 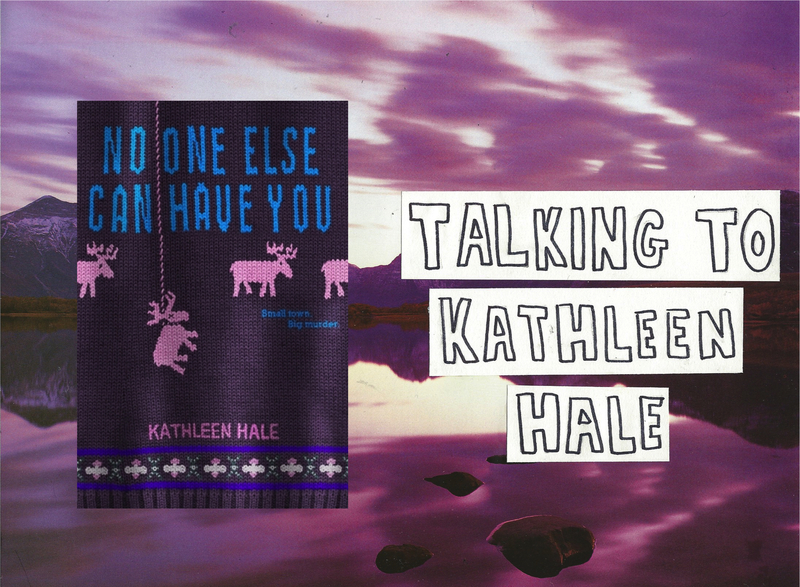 For more information about Kathleen Hale and No One Else Can Have You, check out www.nooneelsecanhaveyou.com . Next ArticleHow Can I Write That?